Taking a break from wedding welcome gifts today and for a good reason. 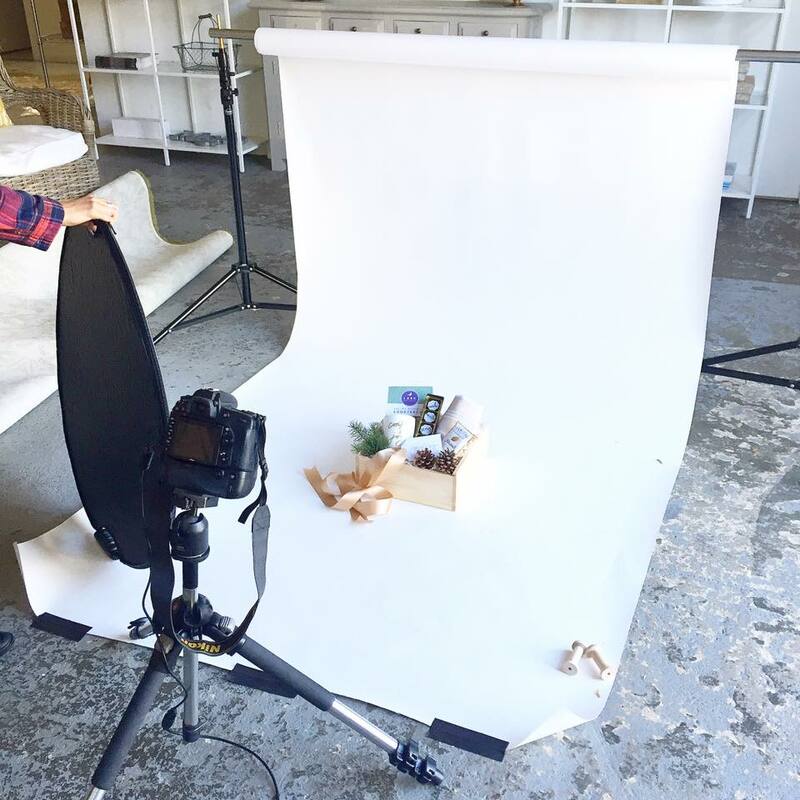 It's time to style and photograph our 2016 Holiday Gift Box Collection! I've always been the type to get irritated when I walk into Target in early October and see the Christmas displays ready and raring to go. I mean, can't we at LEAST have Thanksgiving first? The commercialism of the holiday season has always bothered me. But now that I own an artisan gifting business, I realize I HAVE to start early. Not only is there preparation involved, but our clients really do want to get their gifting done and out of the way so they can truly enjoy all the non-commercial parts of the holiday season. And I'm happy to help! 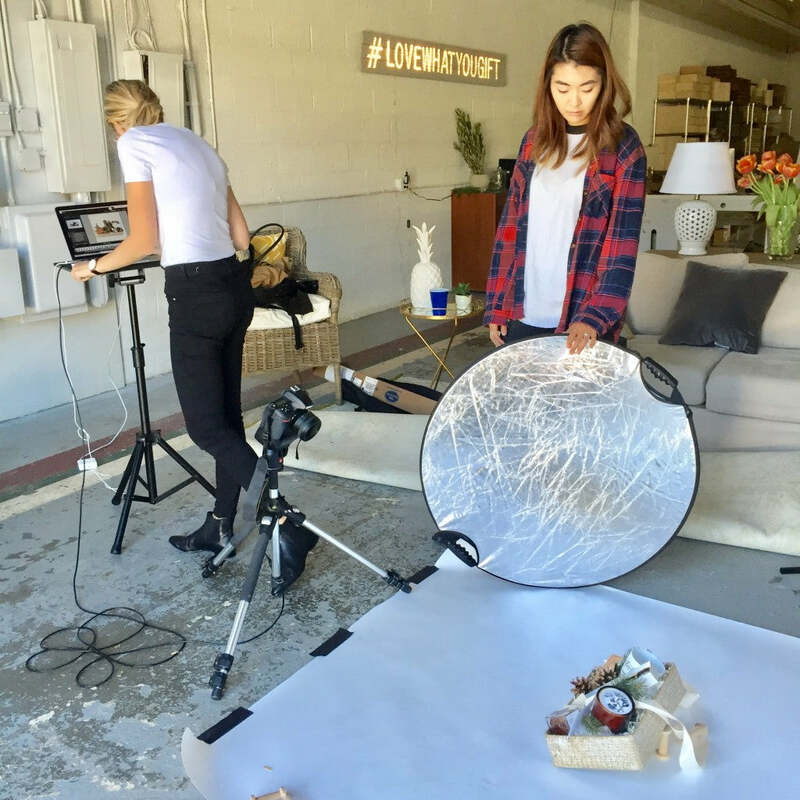 Earlier this week, I invited Laura of Laura Metzler Photography into the studio to shoot our 2016 Holiday Gift Collection. (The collection launches in our online shop on Tuesday, November 9th!!) While we end up with beautiful images for the website after we shoot, the behind-the-scenes isn't always so glamorous. Not to mention, it's isn't always easy. The way things look in-person is far from how they look on camera. We have to tweak, adjust, and tweak some more in order to get each styled gift just right. I'm talking hours, you guys! I don't want to reveal too much but I'll give you some hints. We're offering three "happy holiday" gifts, two Thanksgiving "thank you" gifts and even a "happy new year" gift box. (The "happy new year" is for all you procrastinators out there.) The price points are slightly varied to allow for a little something for everyone while staying true to our brand and aesthetic. The entire collection will have FREE SHIPPING and NO ORDER MINIMUMS. We can drop-ship directly to your recipient list for you and even include a handwritten message on your behalf. Our goal is to make gifting beautiful but also convenient and completely stress-free. We want each and every one of our clients to truly enjoy their holiday season! Check back on Nov 9th. We can't wait to reveal all that we've had in the works!